To train harder or for longer at a higher intensity you should drink an intra workout supplement to maximise during workout training results. As new benchmarks are being set for stronger, more built and ripped bodies in the gym there has also been a rise in the use of intra workout supplements to optimise results. Drinking intra workout supplements can help maximise your training intensity during a workout, decrease fatigue while also assisting muscle recovery and growth post-workout. Research shows that intra workout supplements are essential for achieving peak in-gym performance which helps to generate an ideal anabolic environment for new gains in muscle strength and size. Taking advantage of correct nutrition during the intra workout window can help to overcome depletions of muscle building amino acids and key nutrients that can often limit muscle gains and performance. Here is a quick check list for how to choose the best intra workout supplement. The key ingredients for any best intra workout supplement should be muscle building amino acids, including all 3 branched chain amino acids, leucine, isoleucine and valine. To maximise muscle growth, reduce catabolism (muscle tissue breakdown), and increase muscle energy there should be a surplus of amino acids during and after your workout which can be most easily achieved by drinking an intra workout supplement that is high in muscle building amino acids. For longer and harder workouts beta alanine acts as an intramuscular buffer to offset acid build-up in the muscle during your workout and delay muscle fatigue. The most abundant amino acid in your body, L-Glutamine is a key nutrient for the best intra workout supplements, to assist with muscle recovery, repair and growth. When you train hard at the gym you run the risk of depleting glutamine stores so this is another essential nutrient to look for in any good intra workout supplement. The best intra workout supplements will also contain electrolytes including sodium and potassium to replace the electrolytes that are lost through sweat during a heavy workout while also assisting with during workout hydration. Most guys training hard at the gym will take a pre-workout supplement as well as an intra workout supplement, so it is best for your intra workout to be stimulant free so you aren’t getting a double hit. This also means that your intra workout supplement can be taken any time of the day without any nasty side effects that sometimes come with too many stimulants. Be careful to read the ingredients in your intra workout supplement. Too many intra workout supplements that claim to be the best intra workout supplements still contain ‘proprietary blends’ or the ingredients or dosage aren’t clearly labelled. Simply put this means the manufacturer may be hiding something! 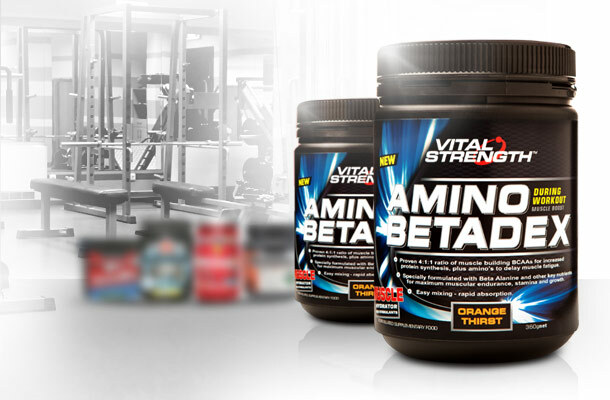 Vitalstrength Amino Betadex during workout muscle boost is one of the best intra workout supplements available in Australia that ticks all the boxes. Vitalstrength Amino Betadex intra workout supplement is packed with the ideal mix of nutrients for greater gains in muscle strength and size while also being low in carbs and sugar to promote ripped, lean muscle growth. Vitalstrength Amino Betadex intra workout supplement contains a specialised amino acid complex that helps to generate peak muscle performance during your workout. This includes a 4:1:1 ratio of branched chain amino acids (BCAA’s), glutamine and taurine as well as beta alanine for greater muscular endurance and better overall workout performance. 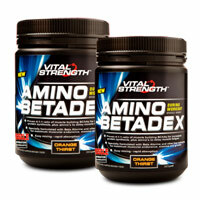 As well as amino acids Vitalstrength Amino Betadex intra workout supplement contains electrolytes, antioxidants (including vitamins and minerals) and natural energisers that help to supply your body with the co-enzymes it needs for metabolism and muscle growth during your workout. So if you’re stamina is lagging in the gym and you aren’t getting the muscle gains that you should be, it may be time to get your hands on one of the best intra workout supplements to optimise training results during your workouts. Intra workout supplements like Vitalstrength Amino Betadex offer you the ideal combination of nutrients for greater gains in performance, muscle growth, recovery as well as greater losses in unwanted body fat. Previous articleHOW DO BASKETBALL PLAYERS MAINTAIN MUSCLE MASS?